That of a medium-sized, short-coated, hunting dog of distinguished appearance and bearing. Robust but rather lightly built, the coat is an attractive shaded golden rust. 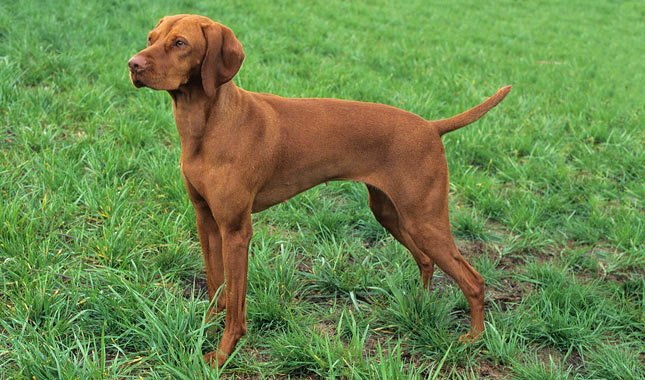 Originating in Hungary, the Vizsla was bred to work in field, forest and water. Agile and energetic, this is a versatile dog of power, drive and endurance in the field yet a tractable and affectionate companion in the home. It is strongly emphasized that field conditioned coats, as well as brawny or sinewy muscular condition and honorable scars indicating a working and hunting dog are never to be penalized in this dog. The requisite instincts and abilities to maintain a "dual dog" are always to be fostered and appreciated, never deprecated. Lean and muscular. Skull moderately wide between the ears with a median line down the forehead. Stop between skull and foreface is moderate. Foreface or muzzle is of equal length or slightly shorter than skull when viewed in profile, should taper gradually from stop to tip of nose. Muzzle square and deep. It should not turn up as in a "dish" face nor should it turn down. Whiskers serve a functional purpose; their removal is permitted but not preferred. Nostrils slightly open. Nose self-colored. Any other color is faulty. A partially or completely black nose is a disqualification. Freckles due to aging or sun exposure are not to be faulted. Ears, thin, silky and proportionately long, with rounded-leather ends, set fairly low and hanging close to cheeks. Jaws are strong with well developed white teeth meeting in a scissors bite. Eyes medium in size and depth of setting, their surrounding tissue covering the whites. Color of the iris should blend with the color of the coat. Yellow or any other color is faulty. Prominent pop eyes are faulty. Lower eyelids should neither turn in nor out since both conditions allow seeds and dust to irritate the eye. Lips cover the jaws completely but are neither loose nor pendulous. Neck strong, smooth and muscular, moderately long, arched and devoid of dewlap, broadening nicely into shoulders which are moderately laid back. This is mandatory to maintain balance with the moderately angulated hindquarters. Body is strong and well proportioned. Withers high. While the Vizsla may appear square, when measured from point of breastbone to point of buttocks and from the highest point over the shoulder blades to the ground, the Vizsla is slightly longer than tall. A proper proportion of leg length to body length is essential to the desired overall balance of the Vizsla. The Vizsla should not appear long and low or tall and leggy. Backline firm with a slight rise over a short and well muscled loin. The croup is gently rounded to the set on of the tail and is not steep, sunken or flat. When moving at a trot, a properly built Vizsla maintains a steady, level backline. Chest moderately broad and deep reaching down to the elbows. Ribs well-sprung and carried well back; underline exhibiting a slight tuck-up beneath the loin. Tail set just below the level of the croup, thicker at the root and docked one-third off. Ideally, it should reach to the back of the stifle joint and when moving it should be carried at or near the horizontal, not vertically or curled over the back, nor between the legs. A docked tail is preferred. Shoulder blades proportionately long and wide sloping moderately back and fairly close at the top. Upper arm is about equal in length to the shoulder blade in order to allow for good extension. Forelegs straight and muscular with elbows close. Feet cat-like, round and compact with toes close. Nails brown and short. Pads thick and tough. The removal of dewclaws, if any, on front and rear feet, is strongly recommended, in order to avoid injury when running in the field. Hind legs have well developed thighs with moderately angulated stifles and hocks in balance with the moderately laid back shoulders. They must be straight as viewed from behind. Too much angulation at the hocks is as faulty as too little. The hocks are let down and parallel to each other. Short, smooth, dense and close-lying, without woolly undercoat. A distinctly long coat is a disqualification. Golden rust in varying shades. Lighter shadings over the sides of the neck and shoulders giving the appearance of a "saddle" are common. Solid dark mahogany and pale yellow are faulty. White on the forechest, preferably as small as possible, and white on the toes are permissible. Solid white extending above the toes or white anywhere else on the dog except the forechest is a disqualification. When viewing the dog from the front, white markings on the forechest must be confined to an area from the top of the sternum to a point between the elbows when the dog is standing naturally. White extending on the shoulders or neck is a disqualification. White due to aging or scarring must not be faulted. The Vizsla is self-colored, with the color of the eyes, eye-rims, lips, nose, toenails and pads of feet blending with the color of the coat. Far reaching, light footed, graceful and smooth. When moving at a fast trot, a properly built dog single tracks. The ideal male is 22 to 24 inches at the highest point over the shoulder blades. The ideal female is 21 to 23 inches. Because the Vizsla is meant to be a medium-sized hunter, any dog measuring more than 1½ inches over or under these limits must be disqualified. A natural hunter endowed with a good nose and above-average ability to take training. Lively, gentle-mannered, demonstrably affectionate and sensitive though fearless with a well developed protective instinct. Shyness, timidity or nervousness should be penalized. The foregoing describes the ideal Vizsla. Any deviation from this ideal must be penalized to the extent of the deviation. Deviations that impact performance and function should be considered more serious than those that affect only appearance. Partially or completely black nose. Solid white extending above the toes or white anywhere else on the dog except the forechest. White extending on the shoulders or neck. A distinctly long coat. Any male over 25½ inches, or under 20½ inches and any female over 24½ inches or under 19½ inches at the highest point over the shoulder blades. Click Here to see required genetic breed tests for dog breeds beginning with the letter V.
Click Here to Learn about breeder background checks on Vizsla breeders if you are looking for Vizsla puppies for sale. Click Here to learn how ResearchBreeder.com can help you find healthy Vizsla puppies for sale.Vizsla puppies for sale. Click Here to order a Breeder or Kennel Background Check on Vizsla Breeders that may have Vizsla puppies for sale. Click here to find the national breed club for Vizsla puppies for sale. Click Here to purchase a list of approved ResearchBreeder.com Vizsla Breeders who have Vizsla puppies for sale.